Bleeding under the Skin | What Are the Causes? 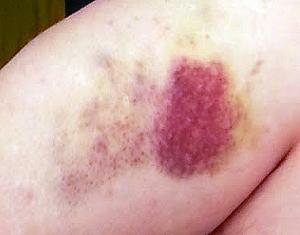 Bleeding under the skin can appear as a bruise or a flat black and blue patch under the skin. The discolored skin is caused by broken blood vessels leaking blood into the tissues that have been injured. If you have bleeding under the skin that is not the result of an apparent injury, it may be the sign of a serious medical condition or disease. Bleeding under the skin that is not caused by an injury can appear as small red or purple dots called petechiae, or in larger flat patches called purpura. There are some common causes of bleeding under the skin that do not necessarily require medical attention, such as a bump, a minor fall, or the normal aging process. If you want high-quality medical care without the hassle of appointments or a long wait, stop by your local FastMed Urgent Care. We are open 365 days a year (with location-specific holiday hours) and offered extended weekday hours for your convenience. 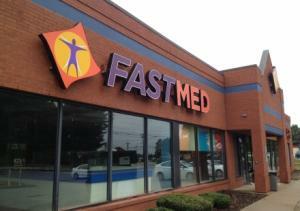 You never need an appointment at FastMed Urgent Care. A member of our highly-qualified medical team will examine your bruises and ask a number of questions to determine the cause of the bleeding under your skin. Be prepared to tell the FastMed Urgent Care medical professional if you are taking any supplements or medications such as aspirin, steroids, or blood thinners.